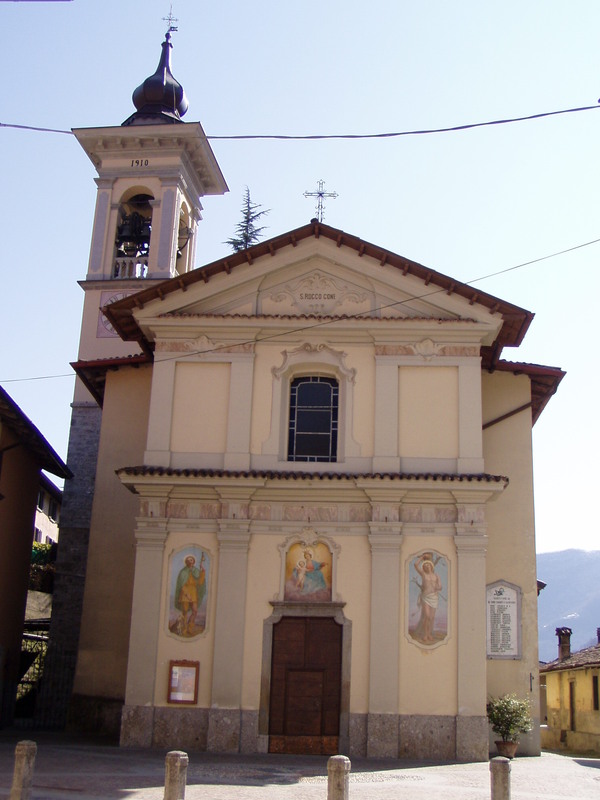 The church is located in the historic village of Cadelfoglia and it is preceded by a pretty little square. Above the central door the image of “St. Mary of the Carmine” is depicted, while the sides are painted within the scrolls with St. Rocco, who is the protector, and St. Sebastian. In 1500 there was already a small roadside shrine dedicated to St. Rocco. The interior of the church has a Greek cross plan, with the presbytery that matches the original chapel. The decoration of the choir and of the presbytery is of eighteenth century taste, beautiful and imaginative and all performed by painting without using plaster. The decoration was restored in 1996. From the eighteenth century is also the main altar carved wooden lacquered gold and with a grandstand in the shape of a small temple. Recently the precious altar was restored by the sculptor Luciano Gritti. The choir is adorned with three large paintings, restored in 1986, of which the central one represents St.Mary of Suffrage and the Angels painted by the Venetian Angelo Lion (1627). The inhabitants of Cadelfoglia are very devoted to St. Rocco, whose feast is celebrated every year on August 16th, as well as “St. Mary of Carmelo” and St. Sebastian, celebrated instead in the months of July and January. Until the ‘60s was “the Addolorata” and St. Ursula were also celebrated.